NBR invites you to join us for a discussion and luncheon on China’s rise and the international order to mark the release of the eighteenth volume in the Strategic Asia series: Strategic Asia 2019: China’s Expanding Strategic Ambitions, edited by Ashley J. Tellis, Alison Szalwinski, and Michael Wills. 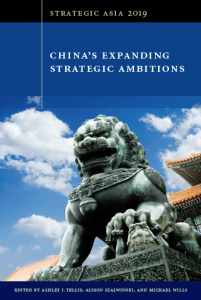 This event will feature remarks by Strategic Asia research director, Ashley J. Tellis, as well as two panels of Strategic Asia authors discussing China’s regional geographic ambitions, and China’s influence on international rules and order. The panels will be followed by a luncheon and keynote remarks by Assistant Secretary of Defense, Randall Schriver. Seating will be limited and served on a first-come, first-served basis. For media inquiries, please contact Dan Aum, Director of Government and Media Relations, at (202) 347-9767 or media@nbr.org.